From 1887, her married name became Walker. [S40] L. G. Pine, editor, Burke's Genealogical and Heraldic History of the Landed Gentry, 17th edition, (London, England: Burke's Peerage Ltd, 1952), page 174. Hereinafter cited as Burke's Landed Gentry, 17th ed. Hon. Agneta Olivia Kinnaird was born on 5 June 1850. She was the daughter of Arthur Fitzgerald Kinnaird, 10th Baron Kinnaird and Mary Jane Hoare.1 She married Roland Yorke Bevan, son of Robert Cooper Lee Bevan and Agneta Elizabeth Yorke, on 7 January 1874. She died on 16 September 1940 at age 90. Her married name became Bevan. [S4714] Ancestry.com and The Church of Jesus Christ of Latter-day Saints, 1881 England Census (n.p. : Online publication - Provo, UT, USA: Ancestry.com Operations Inc, 2004. 1881 British Isles Census Index provided by The Church of Jesus Christ of Latter-day Saints © Copyright 1999 Intellectual Reserve, Inc. All rights reserved. All use is subject to the l, unknown publish date). 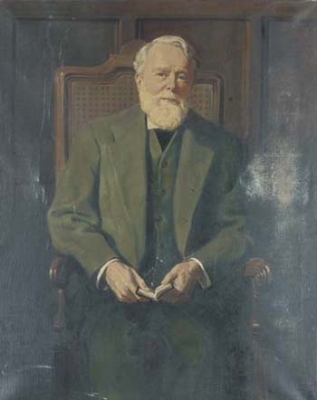 Arthur Fitzgerald Kinnaird, 11th Baron Kinnaird was born on 16 February 1847. He was the son of Arthur Fitzgerald Kinnaird, 10th Baron Kinnaird and Mary Jane Hoare. He married Mary Alma Victoria Agnew, daughter of Sir Andrew Agnew of Lochnaw, 8th Bt. and Lady Mary Arabella Louisa Noel, on 19 August 1875.2 He died on 30 January 1923 at age 75 at London, EnglandG. He gained the title of 11th Baron Kinnaird. Hon. Frederica Georgiana Kinnaird was born on 4 May 1845. She was the daughter of Arthur Fitzgerald Kinnaird, 10th Baron Kinnaird and Mary Jane Hoare. She married Alfred Orlando Jones on 27 December 1870. She died on 10 January 1929 at age 83. Her married name became Jones. Alfred Orlando Jones married Hon. Frederica Georgiana Kinnaird, daughter of Arthur Fitzgerald Kinnaird, 10th Baron Kinnaird and Mary Jane Hoare, on 27 December 1870. He died in 1896. Mary Alma Victoria Agnew usually went by her middle name of Alma.2 Her married name became Kinnaird.